We’ve all heard stories from the age of the dinosaurs, when giant creatures the size of buses or even buildings roamed the land and the oceans, but their disappearance didn’t mean the end of the giants: In fact, megafauna was predominant in every continent on Earth, through multiple glaciations and climate change periods, until about 50,000 years ago during the Late Pleistocene. That is, until humans entered the picture. Our increasing hunting and habitat pressure lead to a great decrease in the numbers and distribution of megafauna, followed by subsequent extinctions. The decline of megafauna started so early in our history, and its progress was so steady, that only now are we starting to acknowledge and study the effects of megafauna in regulating our ecosystems and the impacts of megafaunal loss across the globe. The term megafauna generally describes animals above a certain weight threshold, and it can be divided into four categories. The biggest of all are the megaherbivores (>1000kg), such as elephants or hippos, true ecological engineers capable of altering vegetation on a landscape scale. They have no natural predators (except sometimes on their young), and their population is regulated from the bottom-up by food availability. Slightly smaller are the large herbivores (45-999kg), such as bison or wild horses, which are generally limited from the top-down by predators. Their effects on ecosystems and vegetation can be amplified when they aggregate into groups, which also decreases the risk of predation and improves their survival rates. Regarding carnivores, the biggest of all are the megacarnivores (>100kg), followed by the large carnivores (21.5-99kg). They can regulate the abundance and activity of large herbivores as a result of predation and behavioral change through the “ecology of fear” – herbivores will actively avoid areas with a high presence of predators, essentially limiting their movement within the landscape. An exception to this classification of megafauna would be islands or otherwise isolated ecosystems. There, the weight ranges might be significantly smaller, but the general structure persists. Similarly, the classification is also different for ocean megafauna, which includes both mammals, such as whales and manatees, and fish, such as sharks and ocean sunfish. Here we will focus on the effects of megafaunal loss on continental land. The first hints of abnormal rates of megafaunal loss, after hundreds of millions of years of almost continuous abundance, appear around 1 million years ago in Africa and Southern Eurasia. These early extinctions, such as the sabertooth cat, closely match the timeline of our ancestor Homo erectus spreading across the continent and entering the carnivore niche space. In other regions of the world, such as Australia and the Americas, the timing of megafaunal loss coincides almost perfectly with the global expansion of Homo sapiens. The arrival of humans often left no time for megafauna to adapt: Archaeologists now estimate that it only took about a hundred years for the giant moa birds to go extinct after the Maori landed on New Zealand. The main reasons humans were able to make such an impact on megafauna population in so little time are that their omnivorous and generalist diet allowed them to maintain predation pressure even when prey abundance was low, and that large animals tend to breed less and have fewer offspring than smaller ones. In addition, accompanying domestic dogs may have competed with native carnivores, and the loss of keystone megaherbivore species may have triggered cascades of extinction through changes in habitat and vegetation and loss of a prey base for megacarnivores. Although some other factors, such as climate change, may have acted in conjunction with human pressures in some cases, no close links have been found. In conclusion, anthropogenic pressures on megafauna since the Late Pleistocene have resulted in dramatic losses, especially in the megaherbivores and megacarnivores, of which only 9 and 6 species respectively remain worldwide of the 50 and 15 that existed in the Late Pleistocene. In some continents, the losses have been most dramatic: in the Americas, no megaherbivores remain of the original 27. Large herbivore losses have been drastic, with close to half of the species extinct today. 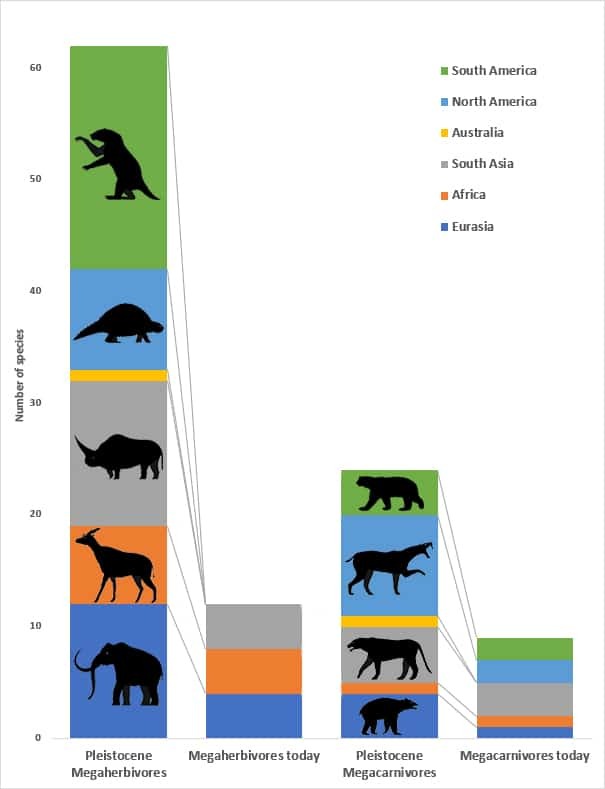 The extinction of large carnivores has also been significant but less drastic, possibly due to reduced competition following megacarnivore extinctions. Despite having avoided extinction for now, many of the still extant megafauna are greatly reduced in distribution and abundance, often rendering them functionally extinct when considering large-scale ecosystem structure and processes.